This wooden combined cleaning kit would make a great gift for anyone, it has a small brass coloured plate (60mm x 15mm) on the front that we offer free engraving on just below the enamel or pewter emblem as shown in the picture. 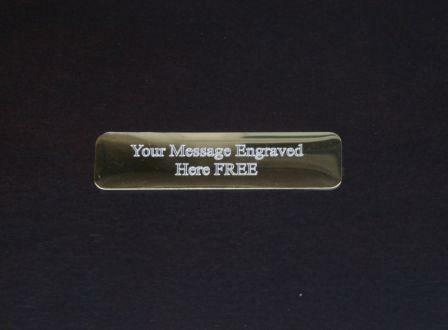 Please fill in the engraving box with your personalised message. 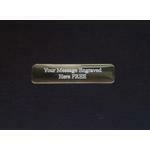 If no engraving message is received we will despatch the item without the engraving plate. We engrave in times roman font and automatically centre. The cleaning kit has all you will ever need. It cleans 12 Bore 20 Bore 410 gauge 45cal. 40cal. 357/38cal. 9mm 30cal. .270 .22 .177 with wire brushes and has wool mops to fit 12, 20 and 410 gauge and 357, 9mm, and .22 cal. All the brushes are able to be used with the two brass rods sets which have adaptors for different size brushes. There are also slotted jags for use with the 50 cleaning swabs supplied. All together a great value gift presented in a really nice wooden box.